Samsung’s T10 MP3 player made its way to Toybox headquarters this week. Measuring a mere 87mm by 40mm by 8mm and weighing in at just 43 grams, I could barely feel the feather-light device in my pocket. It is a combined music player, FM radio, photo album, video player, voice recorder and game player, so it’s pretty fully featured. While I’m not wildly excited about the youth-oriented T10, it does have some very nice features. One of its highlights is its Bluetooth capabilities, which enable users to listen to music on wireless Bluetooth headphones or via a wireless Bluetooth speaker. Another cool feature is the T10’s animated interface — of a puppy called Sam. This is very cute and will surely appeal to the younger audience, but, if you wish, you can change the interface to one of the two more grown-up menu designs also provided. Samsung’s little player comes dressed in a pretty solid, scratch-resistant, but fingerprint-friendly, coating. It is available in five colours — lime, red, black, purple and white. The T10 has seven touch-buttons, which light up when activated. Touch features include a four-way directional pad, a select button, a menu button and a back button. The only other button on the little device is a power/hold button. The “hold” function comes in handy as the touch buttons are very sensitive. While I am definitely a fan of the less-is-more approach when it comes to buttons, I did miss the lack of dedicated volume control on Samsung’s little device. However, sound quality on the T10 is decent. As with Samsung’s other recent MP3 players, the T10 features the proprietary Digital Natural Sound engine (DNSe) sound technology, but I don’t know if this actually enhances the sound experience. Although the T10’s two-inch, 240 x 320 screen is bright and clear, I found it too small to comfortably watch videos on. 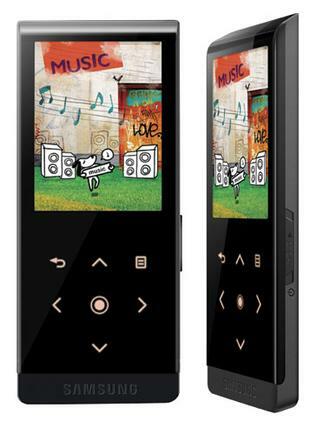 The T10 supports MP3 and WMA files for audio, and supports the WMV and MPEG4 video formats. Charging-up the device is simple: just plug it into the USB port on your computer. Samsung promises up to 30 hours of music and up to four hours worth of movies. To sum up, the T10 is super-lightweight, stylish and of good quality. It is a nice little MP3 player, but, as one of my colleagues put it, it’s not an iPod — although it has the same price as an iPod nano. It comes in three capacity sizes: the basic 2GB T10 costs $199; the 4GB model costs $239 and the 8GB costs $329 — the exact same price as the iPod nano range.